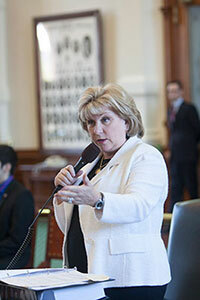 Senator Jane Nelson of Flower Mound carried bills that would cut property taxes by $2.1 billion. Georgetown Senator Charles Schwertner authored the measure that would exempt businesses making less than $4 million from the franchise tax. (AUSTIN) — The Senate approved a package of bills Wednesday that would cut taxes in Texas by more than four billion dollars. Senate Finance Committee Chair Jane Nelson told colleagues that now's the perfect time to give taxpayers relief. "When our economy is healthy, when we have billions of dollars in our coffers, I feel like we ought to give some of that back to the people that sent it to us," she said. Tax cuts have been a major priority for Senate leadership, with Lt. Governor Dan Patrick promising meaningful tax relief in his first press conference of the session and Governor Greg Abbott promising to reject any budget that lacked significant tax reduction. The budget currently being considered by the Finance Committee is written to anticipate the tax cuts passed Wednesday. The first measures, SB 1 and SJR 1 by Nelson, are aimed at lowering property taxes by increasing the homestead exemption. The current homestead exemption was set at $15,000 in 1997 and hasn't risen to account for increasing home prices over the years, said Nelson. Her bill would peg the homestead exemption to a quarter of the median home price in Texas every year, to be determined by the Legislative Budget Board each February. For this year, that would mean a homestead exemption more than twice that of the current one, and it would rise and fall each year as home values change. SJR 1 is the constitutional amendment required to implement SB1, and like all proposed amendments would put the question of the new exemption before the voters in September. It also contains language to exempt the state money necessary to cover the cost of the tax cut from the state spending cap. The state constitution forbids the state budget growing faster than the state economy, which Nelson has said in the past hinders the ability of lawmakers to cut taxes. She has filed legislation to make all tax cuts and debt relief appropriations exempt from the spending cap, but SJR 1 is only a one-time exemption for the estimated $2.1 billion needed to cover the cost of SB 1. The Senate gave approval to two more bills that would cut the state franchise tax assessed on businesses in the state. The first bill, SB 7 by Nelson, is a simple reduction in the tax rate, reducing it by 15 percent. It also reduces the EZ Tax rate by 40 percent, and allows businesses that make less than $20 million a year to file at that rate. 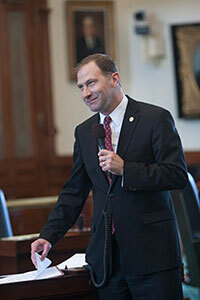 The second, SB 8, authored by Georgetown Senator Charles Schwertner, would increase the exemption threshold. Currently, businesses that make less than $1 million in annual revenue don't have to pay the tax, but Schwertner's bill would increase that to $4 million. He said that it will free 61,000 small businesses from the burden of the tax, while only reducing collections by 8 percent. "It will provide substantial tax relief and provide for significant reinvestment in job growth in Texas small businesses," said Schwertner. All these measures will still have to be considered by the House of Representatives. The version of the state budget passed out of the House Appropriations Committee earlier this week does not include funding for proposed tax cuts, and the difference will have to be worked out between the chambers once each body passes its version of the state budget. 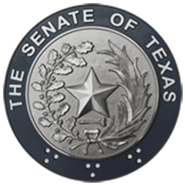 The Senate will reconvene Monday, March 30 at 2 p.m.